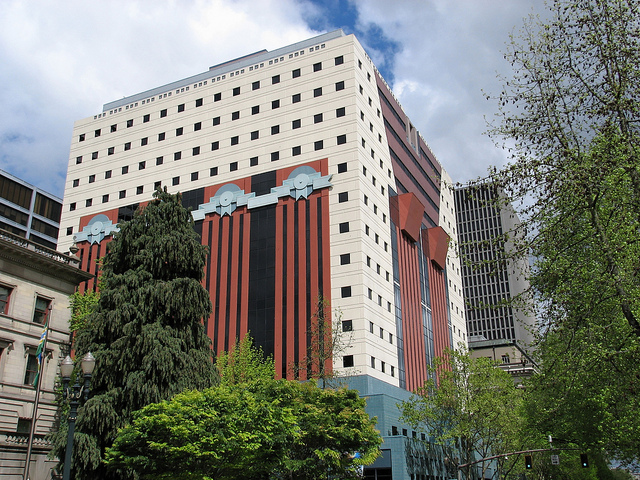 When the City of Portland converted its 600 municipally-owned single-stall restrooms into all-gender facilities back in 2016, the change included converting two multi-stall, single-gendered restrooms on the second floor of Michael Graves’s iconic Portland Building to all-gender facilities, as well. The multi-stall, all-gender restroom change is part of a city pilot program the city developed in conjunction with the $195 million renovation to Graves’s postmodern masterpiece led by architects DLR Group. The city is pursuing various alternatives to single-gendered bathroom facilities as a result of the passage of a recent bill aimed at “removing barriers to a safe and inclusive workplace for employees… creating spaces which are welcoming to all visitors, and… treating all people with respect and dignity,” according to the resolution instituting the changes. City Commissioner Amanda Fritz, originally one of the proponents behind the move toward all-gender bathrooms, was not happy with the result in the multi-stall facilities, however, Willamette Week reports. The Portland City Commission has been meeting in the Portland Building while their usual meeting facilities undergo repairs and, after an inspection, the commissioner became critical of the new arrangement, saying via email to other commissioners, “Being alone in the facility, I was able to stand on the commode in one stall and peer over the top of the divider into the next. It is also easy to peer under the dividers.” Fritz even threatened to refuse to attend the meetings unless something was done about the situation. As a result of the tussle, City authorities moved in March to convert one of the two multi-stall restrooms on the second floor of the Portland Building back to a single-gendered, women’s room. In exchange, one of the multi-stall women’s rooms on the ground floor was converted to an all-gender facility. The change left some, like City Commissioner Nick Fish—an early supporter of all-gender restrooms who originally brought the resolution to Council last year—happier than they were before. Fish told Willamette Week that having all-gender facilities on two floors was better than having them only on one. But still, as Fritz pointed out, the design of the all-gender facilities leaves much to be desired in terms of privacy. The controversy will likely serve as a valuable lesson as the city’s pilot program—and not to mention the renovations to the Portland Building—move forward. The move comes as President Trump has moved in recent weeks to strip students the right to use bathrooms that coordinate with their preferred gender identity and amid a wider cultural rift regarding the use of bathrooms resulting from the passage of North Carolina’s controversial and discriminatory HB 2—the Public Facilities Privacy and —which sought to make it illegal for cities to expand anti-discrimination protections in public places and workplaces in the state.